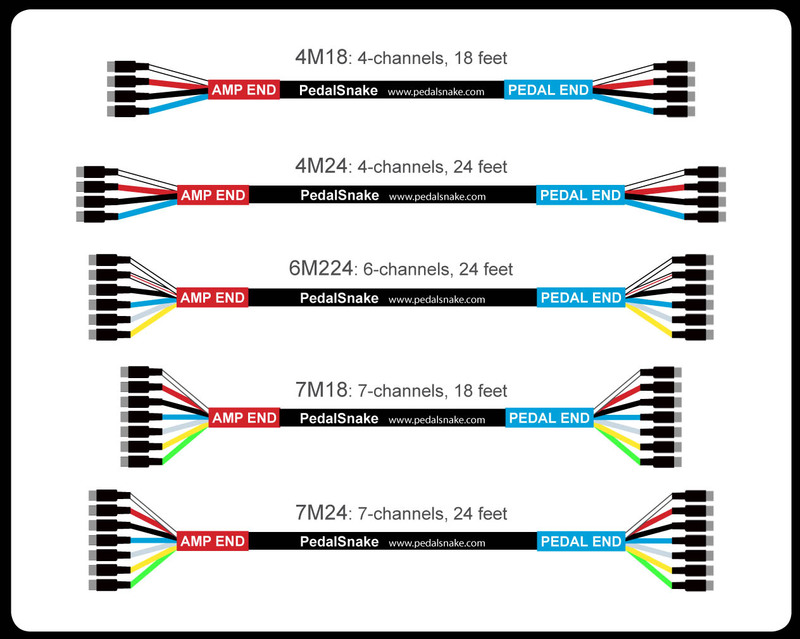 Once you have determined how many lines and channels f you need for your PedalSnake system, you are ready to choose a BaseSnake. See Select Your Lines and Channels. A PedalSnake® System spans the distance between the pedals and amp. A configurable, multi-channel BaseSnake™ is the core component of a PedalSnake system. To configure BaseSnake channels, two types of Pigtail Kits—G-Lines (1/4" GuitarLines), and P-Lines (PowerLines)—can plug into the channels, allowing the PedalSnake System to be customized to any rig, and to mod easily. Based upon the choices you made in Power and PedalSnake: Three Options, and Select Your Lines and Channels, you can now select a BaseSnake with the proper number of channels. Remember, each Pigtail Kit uses one channel. You may have also selected channels for use as Amp Footswtich Lines or MIDI Lines. You may also elect to have spare channels in your BaseSnake for future use. Choose from 4-, 6-, or 7 channels, and 18 or 24 foot lengths.